may need several approaches to understand the problem, including participatory exercises involving affected community members, desk-based research or interviews. 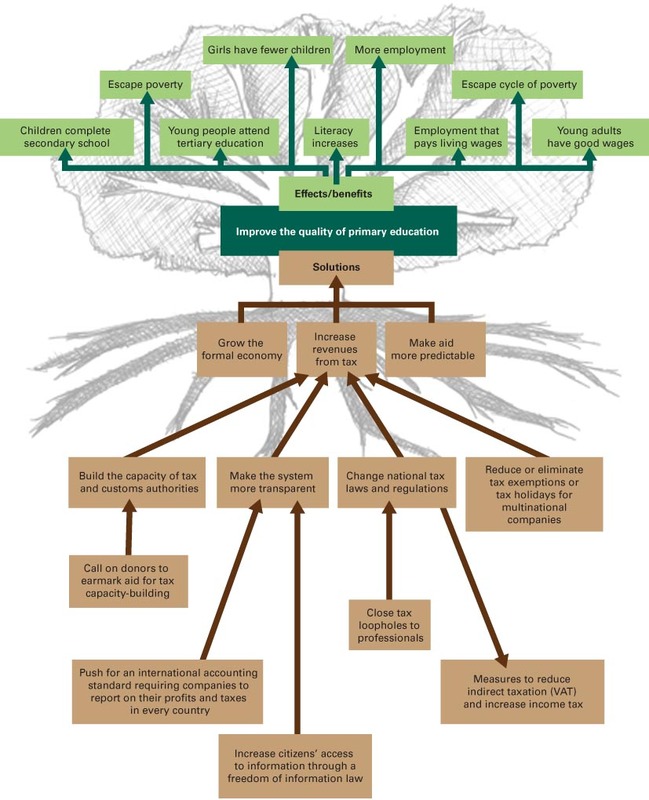 Inadequate essential services, such as health services or education, are a major problem contributing to poverty. Lack of domestic revenue through tax to pay for services is one of the underlying causes. Successful citizens’ campaigns in Bolivia led to the government introducing new taxes on mining companies and using these revenues for education and pensions. Governments are often insufficiently accountable to their citizens. One of the causes is that governments are more dependent on aid than on domestic tax revenues and therefore their greatest accountability is towards donors. Domestic revenue mobilisation is part of the answer, as tax revenues have been shown to increase governments’ accountability to their citizens. Advocacy by civil society in countries including Ghana, India, the Philippines and Brazil has therefore sought to influence governments to adopt fair, transparent taxation policies that can be monitored by the people. Two tools are presented in this section: the ‘But why?’ technique, and problem and solution trees. They are designed to help you focus on the causes instead of the symptoms of the problem. Identifying genuine solutions to a problem requires knowing what the real causes of the problem are. Taking action without identifying what factors contribute to the problem can result in misdirected efforts. This wastes time and resources. Many causes and solutions may apply to your problem, so it is up to you to find the ones that seem most important and that your organisation has the capacity to work with. The ‘But why?’ technique examines a problem by asking questions to find out what caused it. Each time an answer is given, a follow-up ‘But why?’ is asked.For example, if you say that people in poor communities don’t have access to clean drinking water, you may ask yourself ‘But why?’ Once you come up with an answer to that question, probe the answer with another ‘But why?’ question, until you reach the root cause of the problem. For example, does the problem start with lack of hygiene education, resulting in people not caring about clean water, or is it because they don’t know how to dig safe drinking water wells? Or is it a result of government’s failure to implement well-digging programmes? If it is a result of government failure, why is this happening? Is it because of a lack of money? Why is there a lack of money for drinking water wells? Is the government inefficient at collecting taxes? Are the taxes misspent? How does the ‘But why?’ technique work? 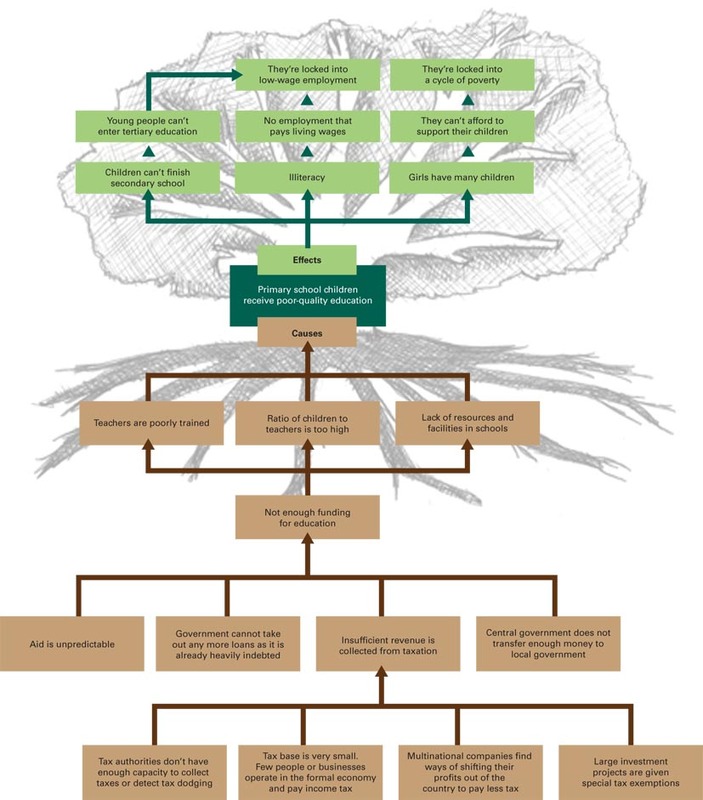 Problem and solution trees are a good way of analysing an issue and can be easily used in a group.The problem tree enables you to identify the root causes and main effects of the problem. 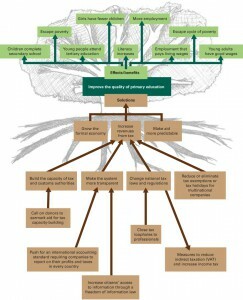 By then using a solution tree, you can turn the problem into a positive goal for your advocacy, the root causes into possible solutions, and the effects into potential benefits. For detailed instructions on how to use problem and solution trees, see Exercise 2 in the interaction pages at the end of this chapter. 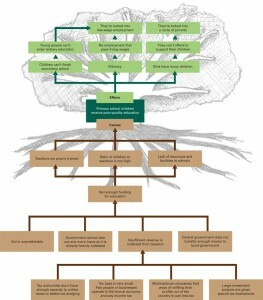 The problem tree exercise may throw up multiple root causes of a problem. Prioritisation is therefore important so you don’t overstretch yourselves and risk being ineffective. result in real improvement in people’s lives? give people a sense of their own power? be widely and deeply felt? build lasting organisations and alliances? provide opportunities for women and others to learn about, and be involved in, politics? promote awareness of, and respect for, rights? link local concerns with larger-scale, even global, issues? provide potential for raising funds? enable the organisation to further its vision and mission? be winnable? Does it have a clear target, time frame and policy solution? find facts and stories to illustrate your issue. These are important to explain and persuade both policy-makers and your potential supporters of your case. In Nicaragua, a coalition of civil society organisations (CSOs) led by Coordinadora Civil and Instituto de Estudios Estratégicos y Políticas Públicas (IEEPP) has long worked to improve education in the country through campaigning for increased education spending. Coalition partners have recently decided to address tax policy issues and include tax reform as a specific part of their advocacy.This is a result of their problem and solution analysis, which led them to see that tax policies – specifically the level of tax collection and the inequity within the tax system – are fundamental obstacles to increasing spending on education. Civil society organisations in Sierra Leone have been campaigning to their government for greater transparency and accountability and increased revenue from the extractives sector. Sierra Leone is rich in mineral resources and a number of foreign mining companies are reaping the benefits, yet the country captures woefully little revenue from the sector because of overly generous tax breaks and limited administrative capacity. Although Sierra Leone exported US$145 million worth of minerals in 2007, only US$10 million remained in the country – representing only 5 per cent of total government revenue. In part because of its failure to tax the mining sector, the government has sought to raise revenue through other means. In 2009 the government introduced a new goods and services tax (GST) – similar to value added tax (VAT). Shortly after this new tax was introduced, campaigners in Sierra Leone identified the potentially regressive nature of the new tax as a serious problem and they linked the issue with their existing work on taxation in the mining sector. So they commissioned research to deepen their analysis of the tax structure in Sierra Leone, including to see how the GST would be felt by different constituencies.The research comes at a time when those working on tax in Sierra Leone are seeking to broaden and strengthen their network and to address tax and development issues beyond the extractives sector. So as well as seeking to develop analysis and generate proposals for an equitable tax alternative that can be shared with policy-makers, the research report is also intended to ‘support more extensive and informed public debate and advocacy around tax issues’.This is an example of a well-timed proactive research-for-advocacy initiative.